Bradburn, Jamie. "Toronto Feature: Palace Pier (en anglais seulement)". The Canadian Encyclopedia, 02 July 2015, Historica Canada. https://www.thecanadianencyclopedia.ca/fr/article/toronto-feature-palace-pier-en-anglais-seulement. Accessed 20 April 2019. "Palace of Fun on the Lake"
That Palace Pier opened was a miracle. 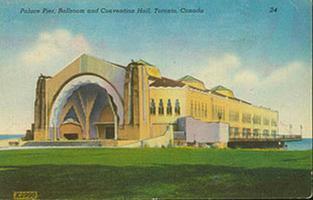 When its original developers received official approval to build an entertainment complex 1 800 feet into Lake Ontario in 1927, they envisioned a grand ballroom holding 3 000 dancing couples, a "palace of fun" for bowling and skating, a bandstand, a theatre, covered walkways, and a steamship dock. But poor fundraising and the Great Depression delayed the laying of a cornerstone by four years. Only the ballroom was built and it stood vacant for a decade. 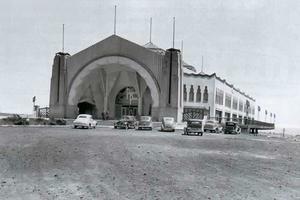 In June 1941, Palace Pier finally opened as a roller rink. Comedian Bob Hope headlined the grand opening fundraiser for British bombing victims. After a short performance, Hope signed autographs for an hour. According to the Toronto Star, Hope "joked with the crowd, sang at the top of his voice when the mood struck him, or dazzled some sweet young thing with a look." Over its two decades as an entertainment venue, Palace Pier hosted big bands, dances, political rallies, and boxing matches. Its demise was swift: an early morning blaze in January 1963, visible from Buffalo, reduced it to ruins. 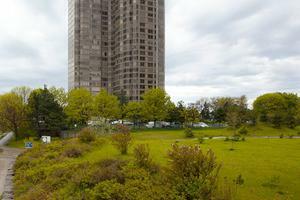 The site sat vacant for a decade until a condominium development assumed its site and name in the mid-1970s. Today, one memorialized concrete pier remains from the original structure, south of the Waterfront Trail and west of the Humber River.